Word association time. When I think of ‘Round About Midnight, what word comes to mind when I think of each musician? ‘Round About Midnight and I go back a long way. I can remember buying it on cassette (!) back in December 1989. If anyone remembers those old “Columbia Jazz Masterpieces” tape reissues from the late ’80s, you know that the “audio quality” ranged from somewhere between “bad” and “not quite as bad.” Even my very nice Nakamichi cassette deck could not make silk from this sow’s ear. But still, I was immediately obsessed with it. Part of its allure is certainly the contemplative cover photo of Miles, the vibe of which seems to permeate the album. I can actually remember when I listened to this for the first time. I was driving in my maroon 1985 Plymouth Reliant, at night. Not having a tape deck in that otherwise luxurious ride, I used to haul my Panasonic boombox with me everywhere, sitting it right beside me on that Chrysler-Quality® bench seat.1 It was pretty powerful, and for what it was, it sounded pretty darn good, especially with a high quality homemade cassette. And it made this particular tape’s limitations bearable, to the point where I basically wore the thing out. So much so that I almost don’t need to listen to this anymore, as I can replay most of it in my head, complete with solos. 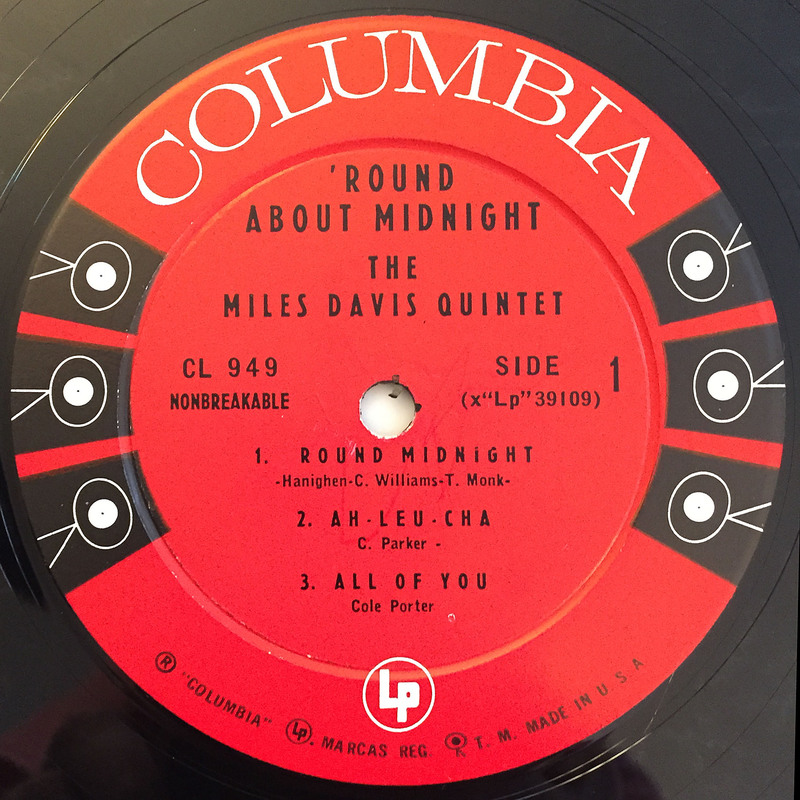 No song more effortlessly evokes a mood of nocturnal melancholy than Monk’s “‘Round Midnight”, and The First Great Quintet’s take on it is simply definitive. The intro, which was unique to the FGQ’s version, recalls a reluctant rendezvous with a mysterious woman, Film Noir 101 stuff. And from there, the drama slowly builds. 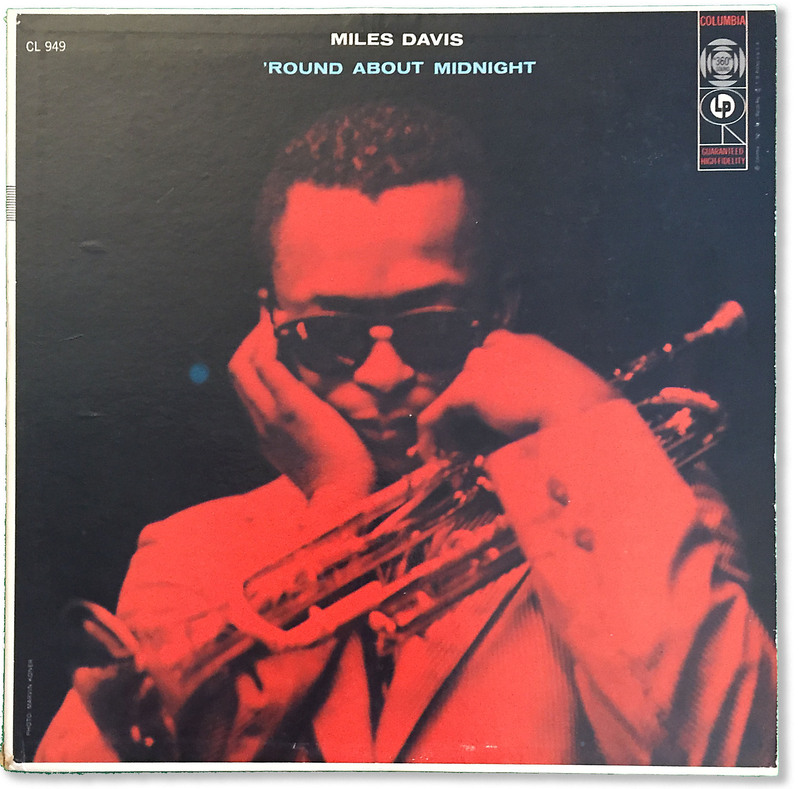 I’m a huge fan of Miles’ use of the mute, and he plays extraordinarily with it on the title tune. At times, it can pierce a bit, and maybe taking a step back from his mic might have been wise, but his mute work throughout this album is on the shortlist for the best in his career. Coltrane’s solo is utterly aching and demonstrates his ability to make his point with relatively few notes. “Ah-Leu-Cha” is an old Bird tune that picks up the pace quite nicely, offering the boys a chance to really air things out on some rhythm changes. As usual, Philly Joe Jones gives a master class in state of the art jazz drumming.2 Someday, when we are visited by space aliens who ask, “What is this ‘jazz drumming’ we’ve heard so much about?”, all we’d have to do is play them “Ah-Leu-Cha.” All of the soloists shine on this one, with Red Garland logging his first solo on the album. During his quintet years, Miles occasionally challenged his bands to perform alchemy on some pretty…um…cheesy selections. Songs like “Surrey with the Fringe on Top”, “Billy Boy”, and “Someday My Prince Will Come” were never really part of the standard jazz repertoire. But you’d never know that from hearing Miles’ interpretations. Each is bestowed with the same genius and creativity that would define all his classic-era music. On Midnight, the fivesome works wonders on the hoary (even in 1957) pop tune “Bye Bye Blackbird”, with Miles using his muted horn to penetrate the most cynical hearts. Trane’s solo stands out for its absolute lack of clichés, each line sounding like he crafted it especially for “BBB.” It’s impossible to overstate how difficult it is to improvise a solo like this, and it is a reflection of the endless hours of practice to which Trane committed himself. 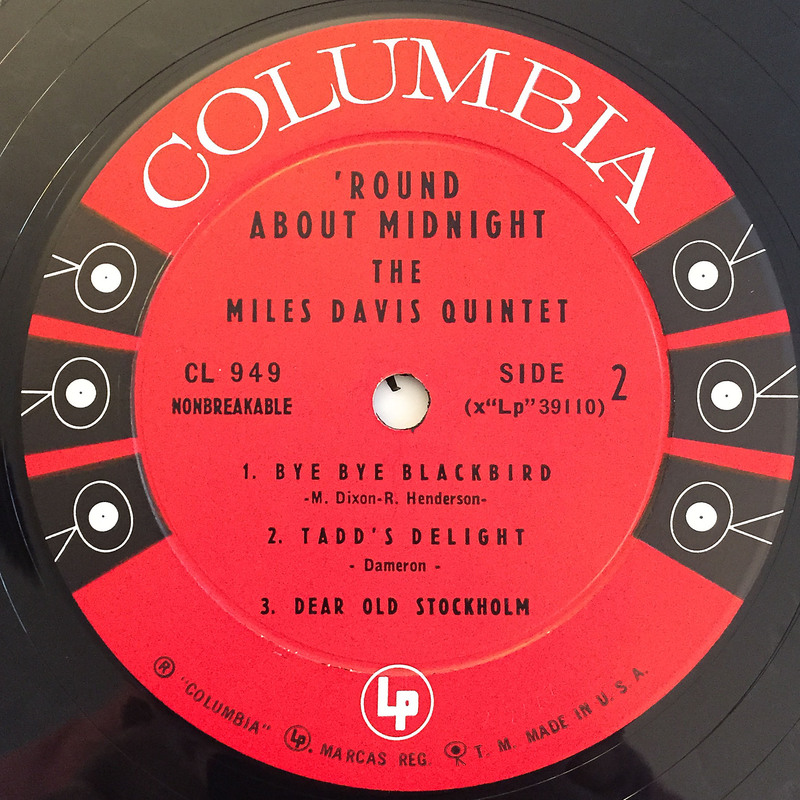 Of all of the FGQ’s uptempo numbers, few have made me happier over the years than “Tadd’s Delight.” With its buoyant head and speedy tempo that almost seems to stutter, “TD” is ’50s jazz at its zenith. The solos flitter and flutter, anchored by bassist Paul Chambers. It’s easy to forget that Chambers was just 20 years-old when sessions for this record began, so impeccable is his swing, his intonation, and his inventiveness, producing chorus after chorus of new variations on the changes. Along with Philly Joe, he gives one the impression of a train rolling along, summoning listeners to get onboard, or be left behind. #FOMO indeed. Finally, in “Dear Old Stockholm”, we have one of my all-time favorite Miles tunes. A Swedish folk tune, “Stockholm” was not an uncommon tune in the ’50s and ’60s, with artists like Stan Getz, Donald Byrd, and Curtis Fuller each recording versions of it. The present version sounds almost menacing at times. During Paul Chambers’ solo, with Garland syncopatedly stabbing thoroughly modern sounding chords and Philly Joe working the brushes, I’ve always pictured a witch’s cauldron being stirred. I may be alone on that, but I like the image. In the jazz record collecting world, Columbia titles are not a “high status” score. Wait, what? Miles Davis is not high status? Not if he’s on Columbia. There’s not enough scarcity.3 But…that means you can get a record like this, in fine condition, at a very affordable price. That’s not to say cheap, as everything is relative. 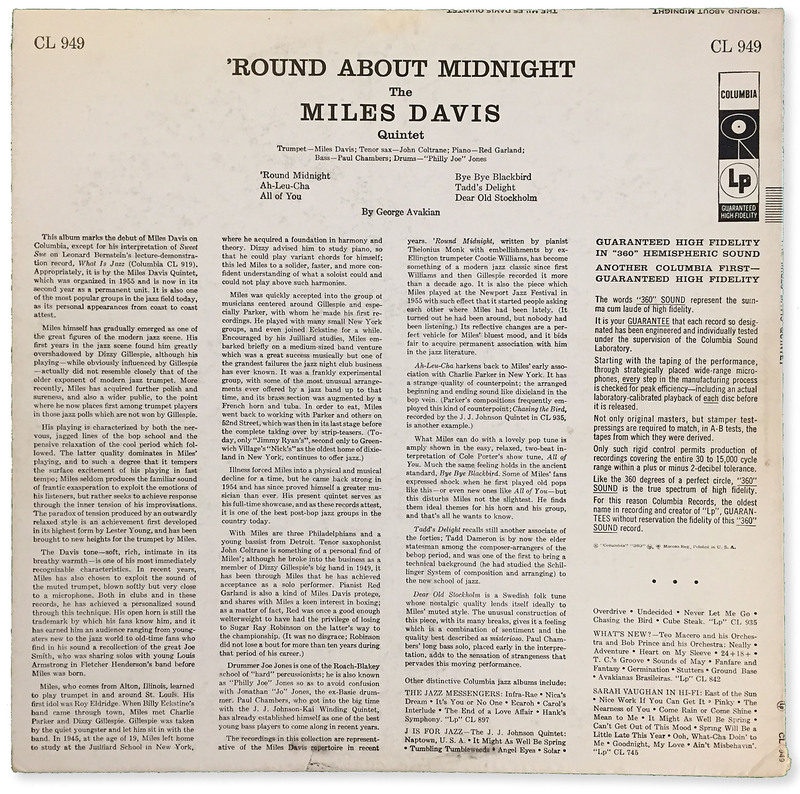 But it’s a brilliant, first pressing Miles Davis Quintet record, and it didn’t cost the equivalent of a first/last in a big city apartment. As for the details, it’s the standard-issue Columbia, 6-eye mono. Is there a human alive who thinks that later-era Columbia labels looked cooler than the 6- or 3-eye beauties? Especially the 6-eye, which is truly an iconic example of graphic design. Obviously the music matters, but the package adds an intangible something, to the product.